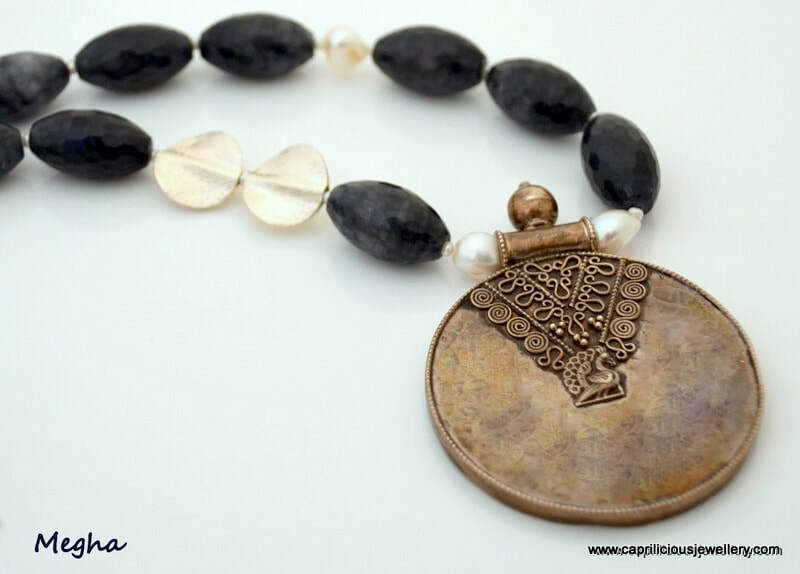 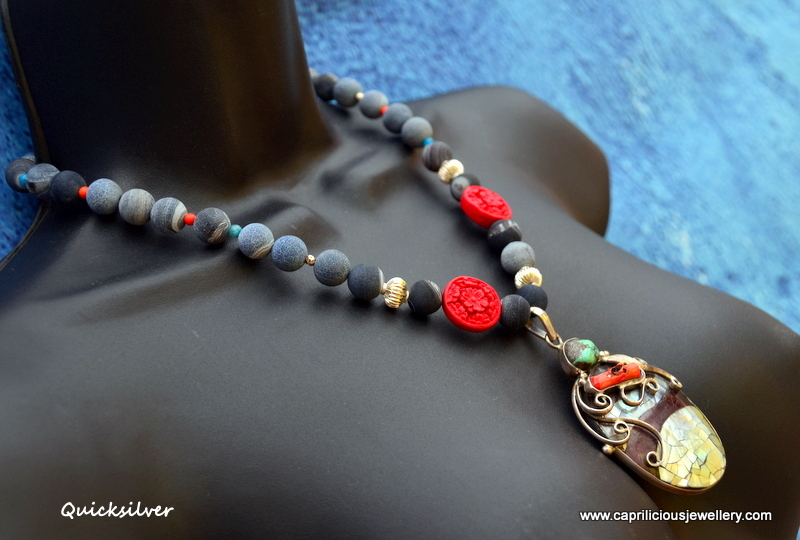 It gives me great pleasure to present a glamorous and seductive collection to the Caprilicious website - made with silver sourced on my travels, inspired by beautiful jewellery from around the world. A beautiful piece of turquoise from the Sleeping Beauty mine in Arizona, carved into a serene face, topped with a silver headdress and set with iolite is strung on a necklace of 2 strands. 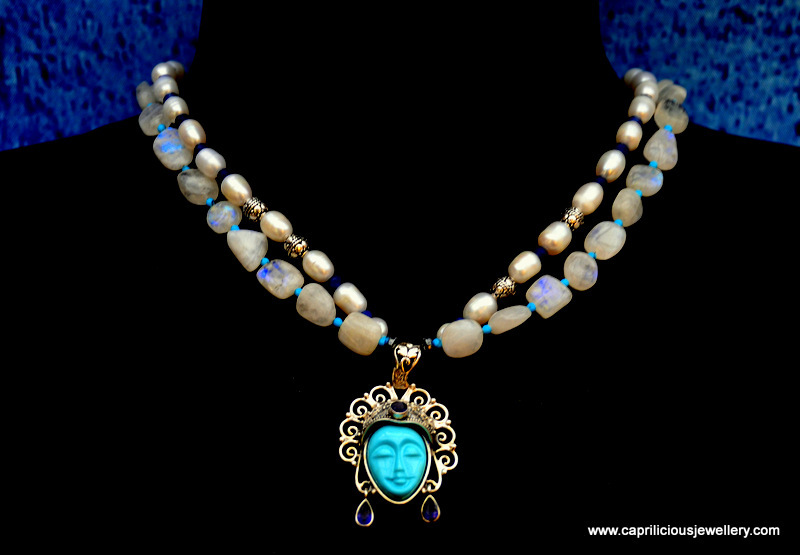 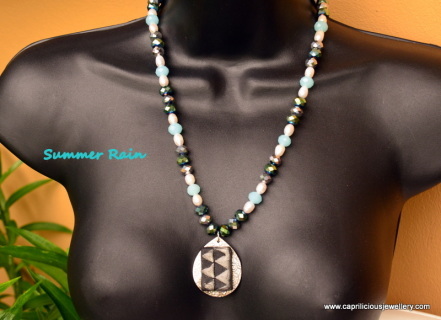 20" long, the necklace is made of moonstone nuggets which flash with an inner secret fire when you move, interspersed with tiny turquoise beads. 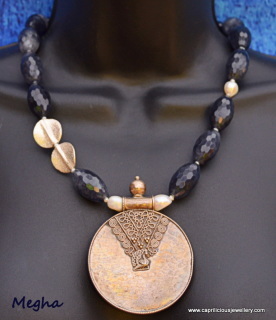 The inner strand is of pearls, Bali silver beads and iolite. 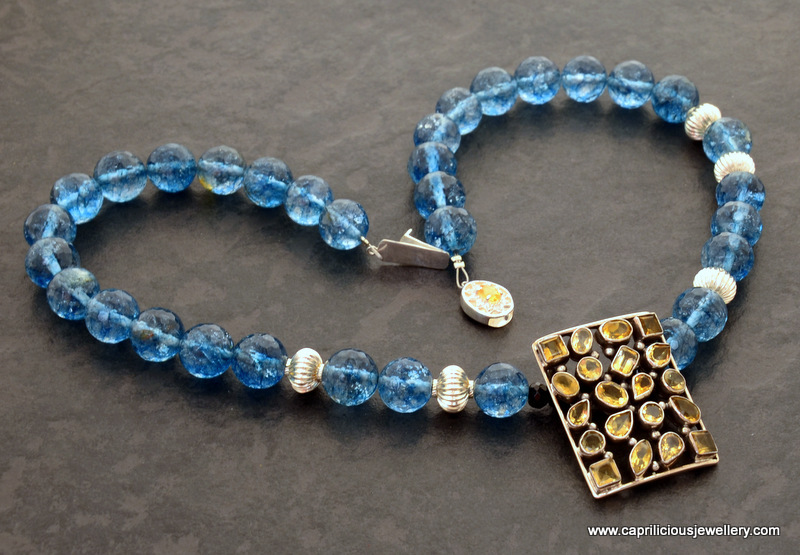 A sterling silver toggle clasp finishes the necklace perfectly. 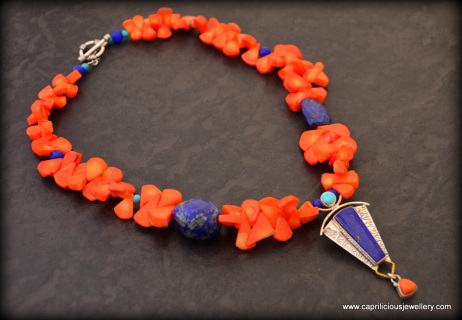 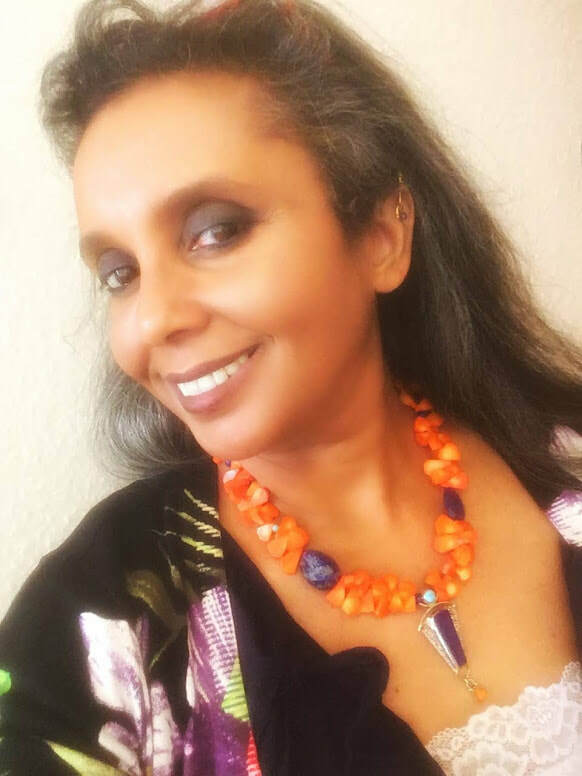 22" of delicate orange coral teardrop beads, carrying a sterling silver dual colour pendant set with lapis lazuli and a turquoise with a little coral dangle that matches the coral in the necklace. 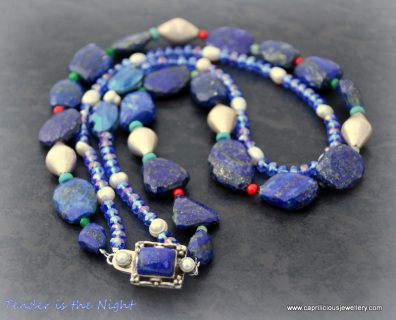 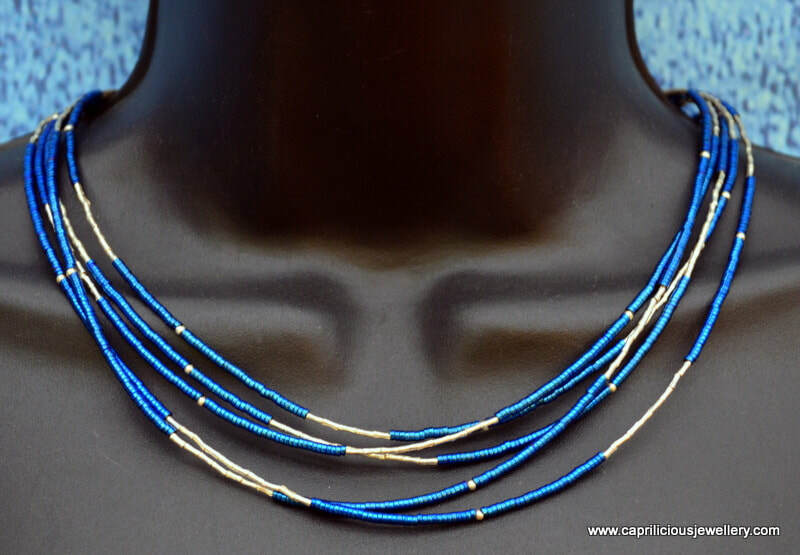 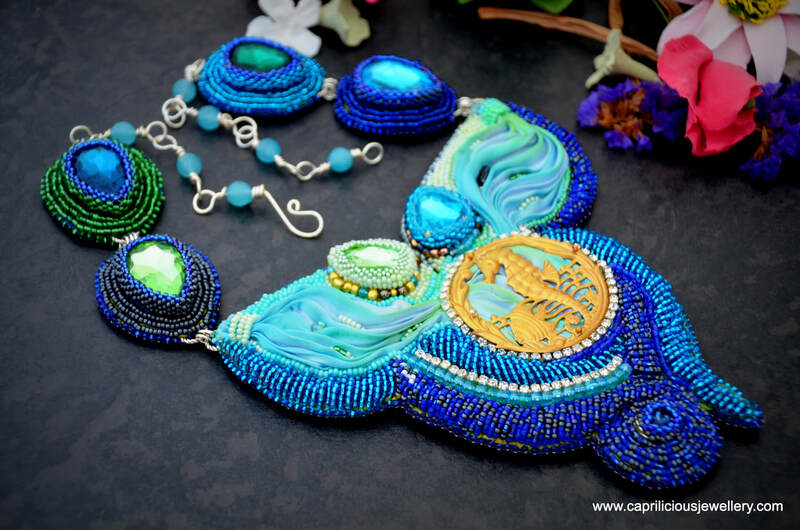 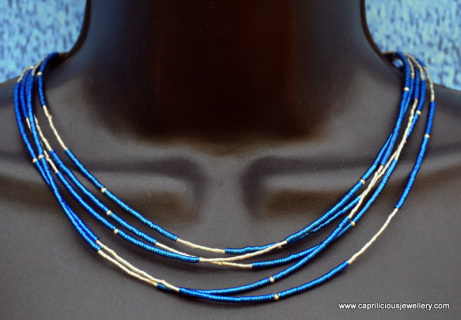 The teardrop shaped beads resemble petals that have been strung together into a garland with a couple of fairly large, hand faceted lapis lazuli beads from Jaipur. 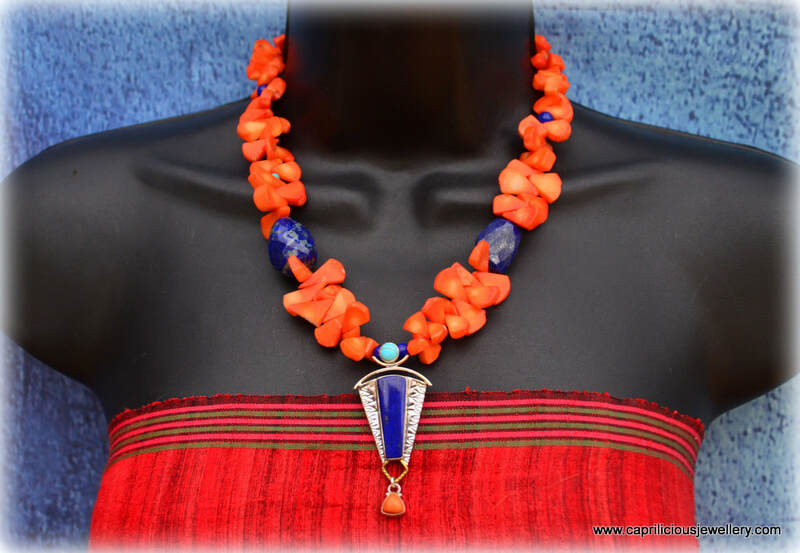 Channeling the spirit of the bohemian surrealist Mexican painter Frida Kahlo, this necklace is wistfully evocative of interesting times - you will love the way it sits around your neck, light yet substantial, with an ornamental toggle clasp to close. 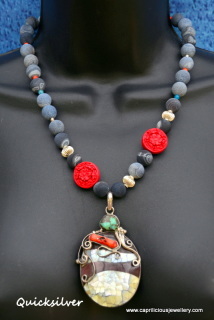 Lie back and smell the flowers in this necklace! 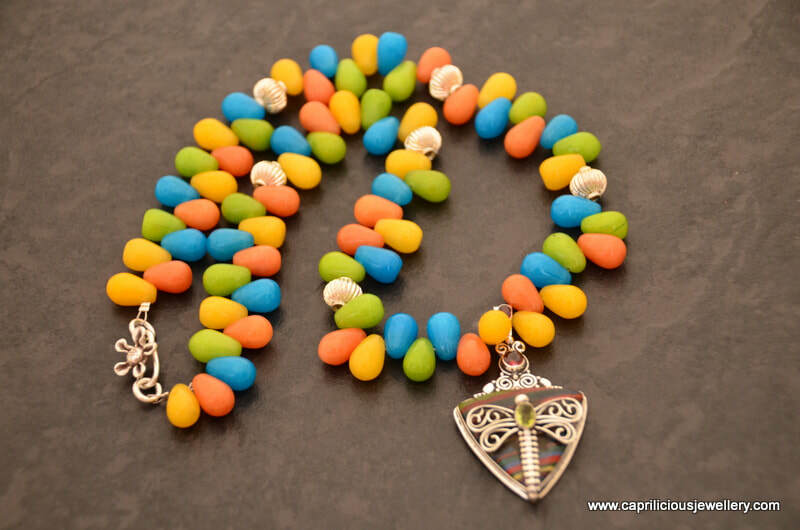 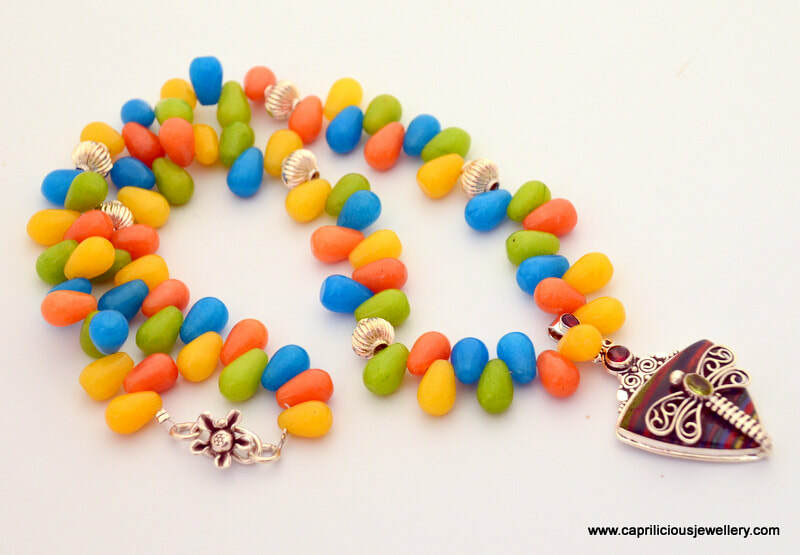 This necklace is bursting with the sweetness of a sugar hit - colour enhanced jade teardrop beads in ice cream colours with a few silver beads thrown in to break up the monotony ( if such a word exists in the description of this necklace). 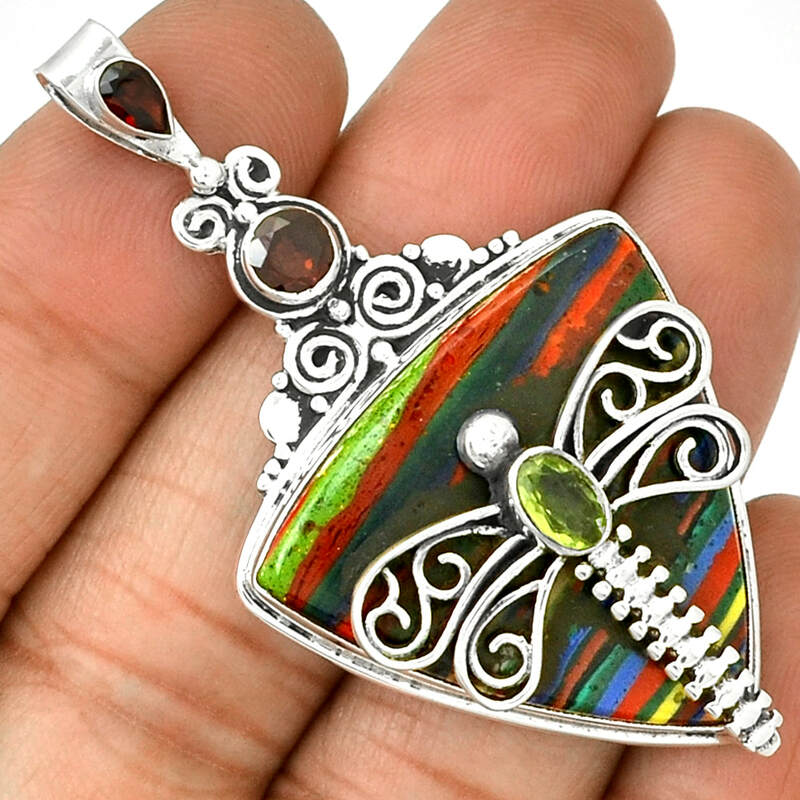 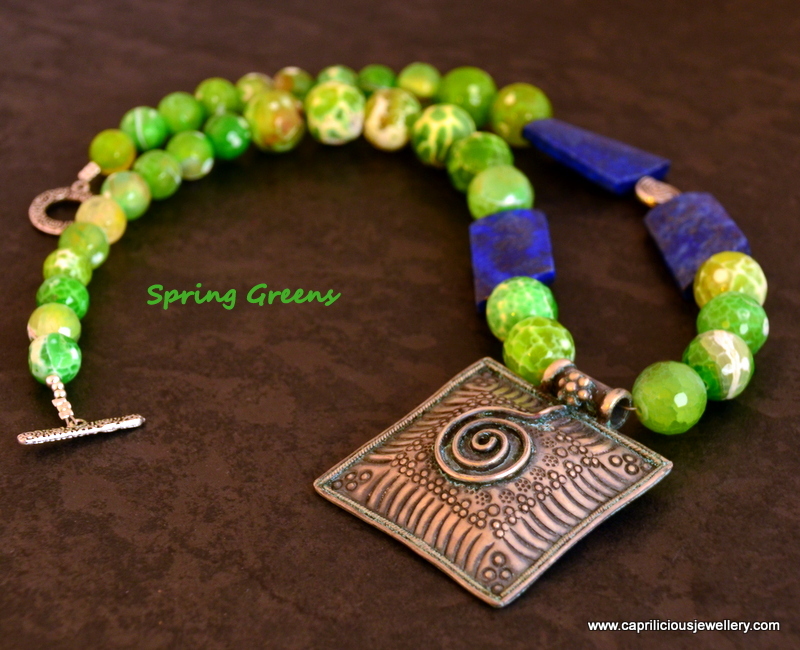 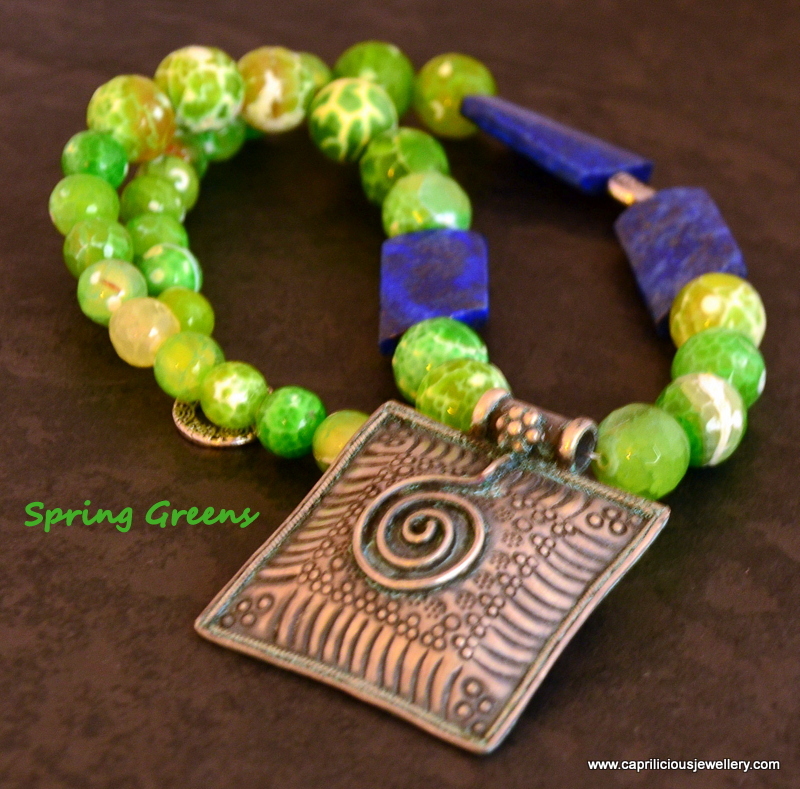 The necklace is 21" long and carries a sterling silver pendant from Indonesia, set with a triangular rainbow calsilica, and accented with peridot and garnets. 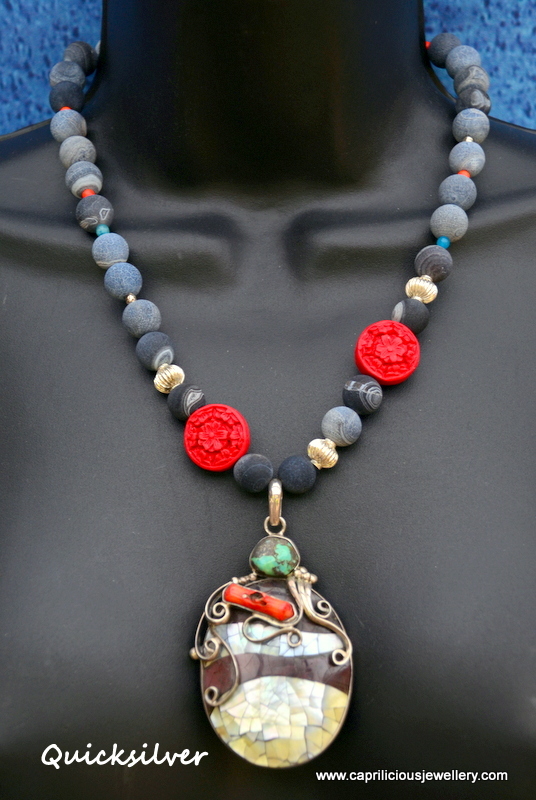 A dragonfly appears to hover over the pendant. 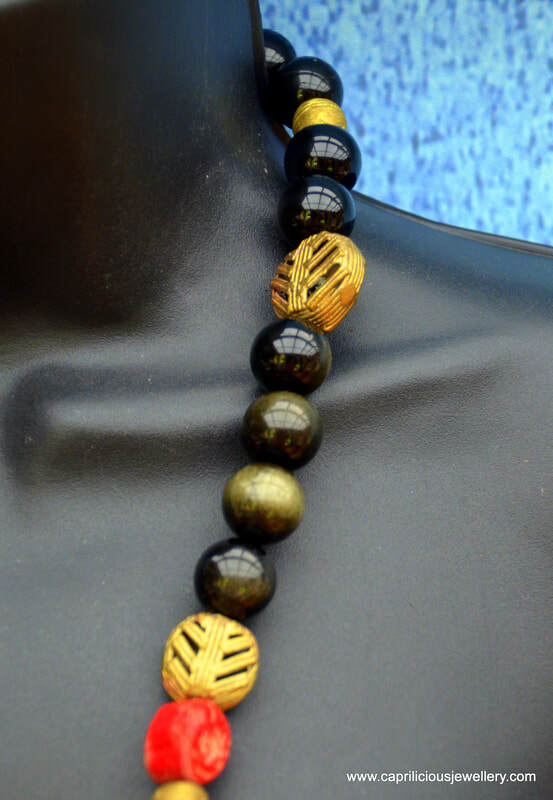 Worn during the day or the evening, this necklace goes with everything and bring a smile to everyone who looks at it - you will find yourself looking in windows at your reflection just to break into a delighted smile. 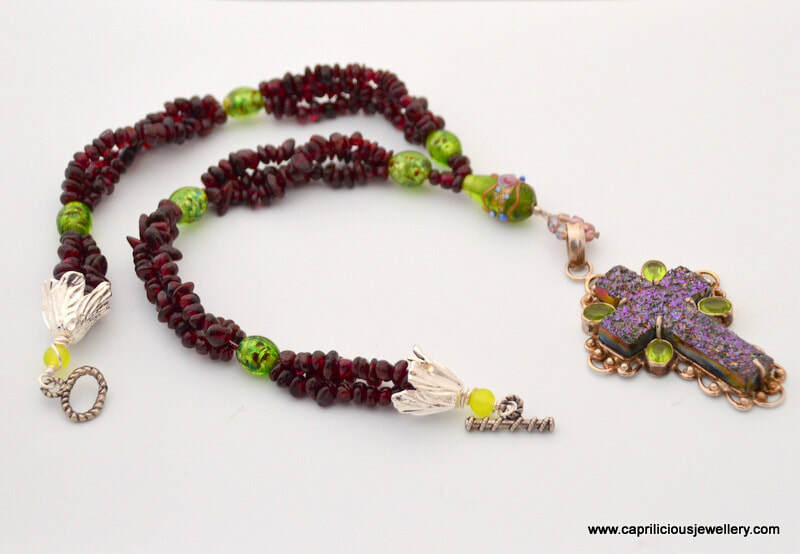 The clasp is a very pretty handmade hook, embellished with a daisy. 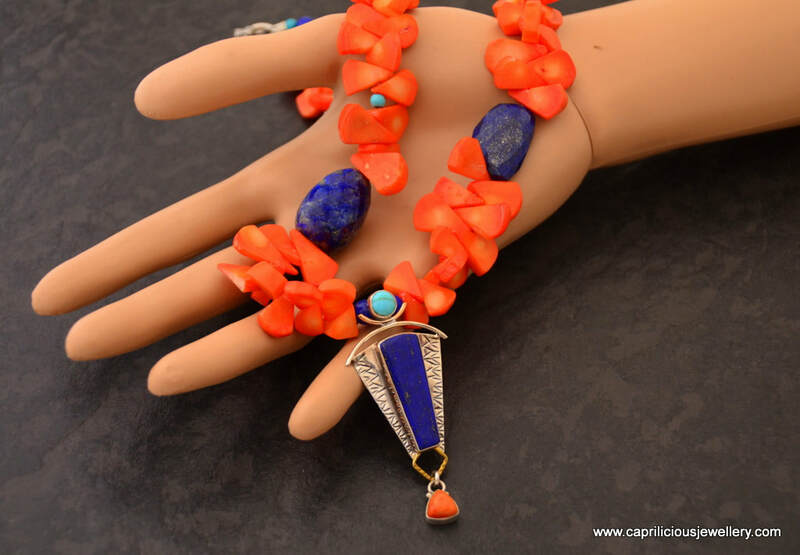 Bright, beautiful and summer-ready, calling out with the vibrancy of Capri and the Mambo Italiano. 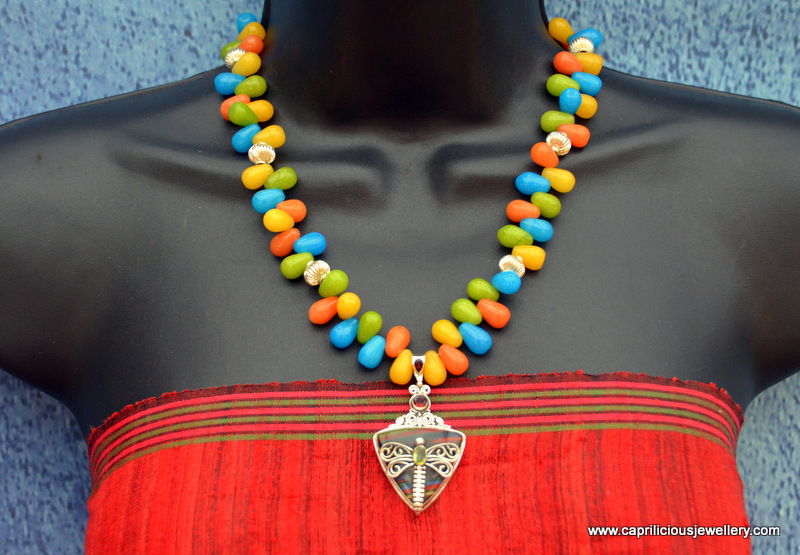 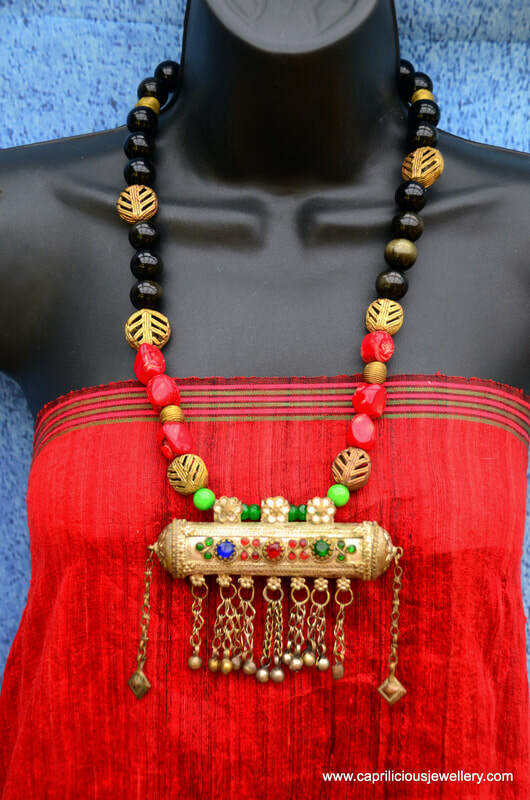 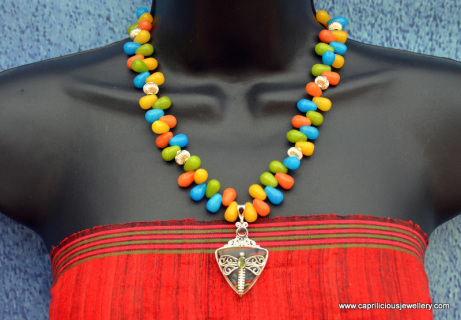 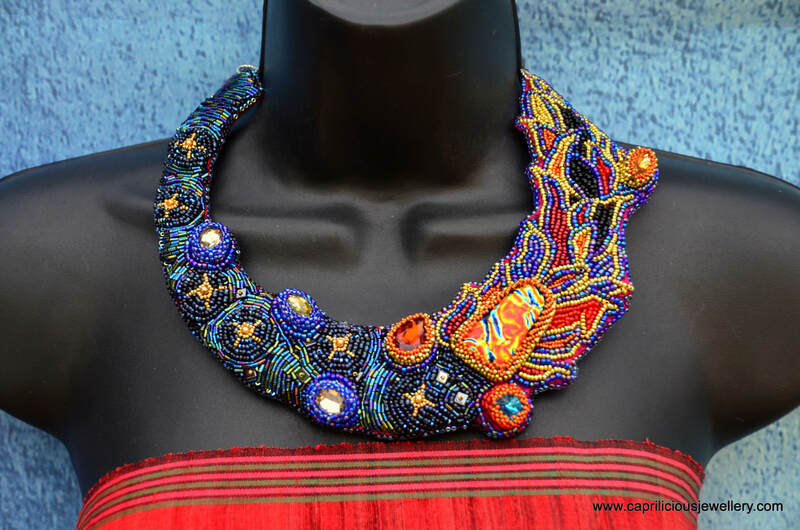 21" long, this necklace has beads sourced from Rajasthan, India. 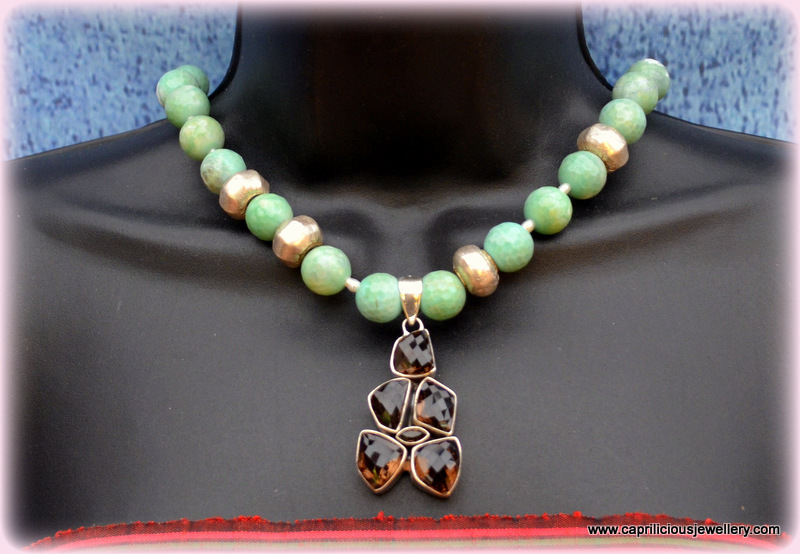 The mint green agate beads are so cool, you can almost taste them, They are set off by tiny freshwater pearls and hexagonal silver beads, and the necklace is closed with a sterling silver toggle clasp. 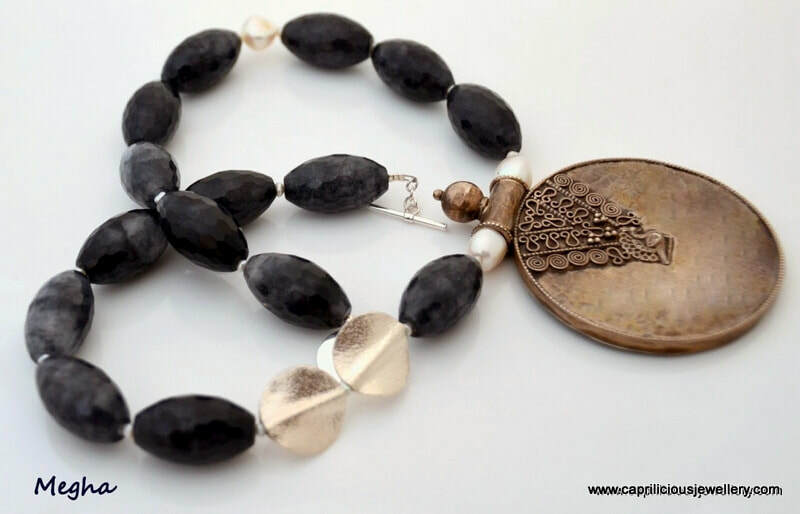 The pendant is made of the most beautiful cushion cut, plump, faceted smoky topaz, set in sterling silver and also sourced in Jaipur. 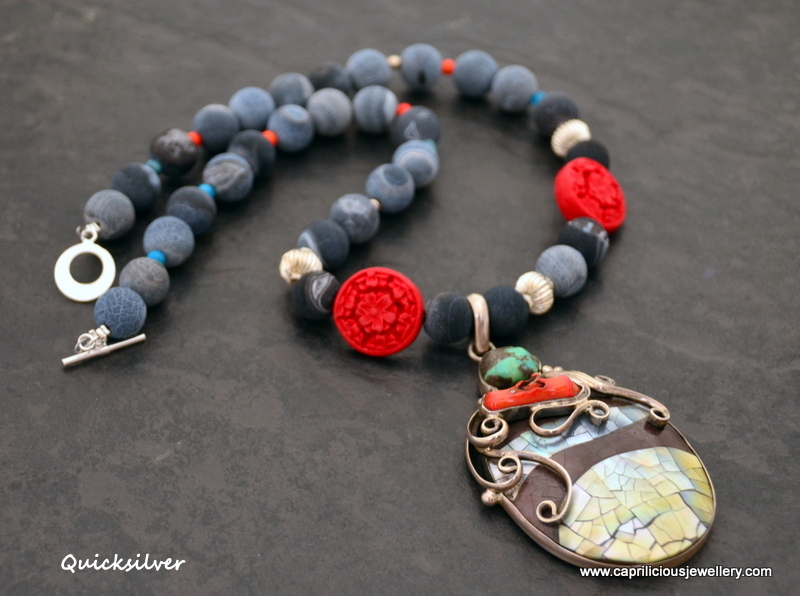 The depth of colour in these stones is such that you want to dive into them. 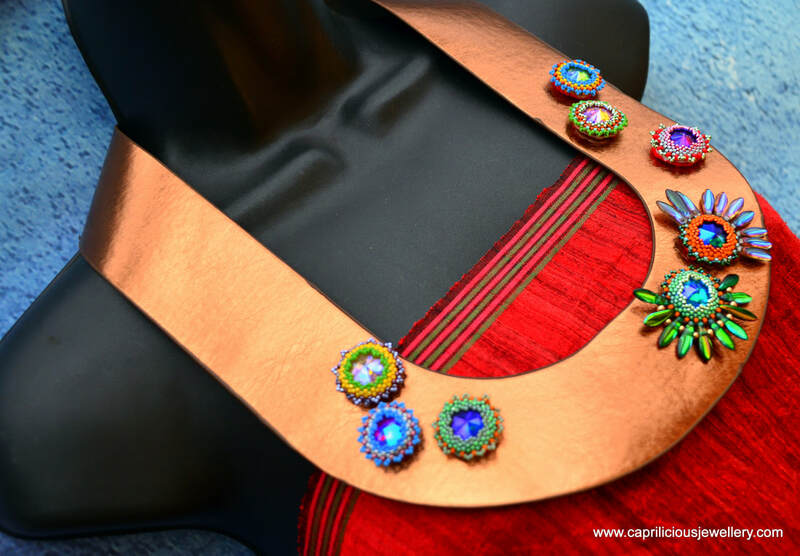 A truly delectable piece for the discerning jewellery lover, it will take you effortlessly from day to night and keep you in the spotlight - compliments assured! The piece was inspired by a Degas painting, and by a picture of Misty Copeland, who posed for pictures based on Degas' drawings - click on the picture if you want to see more. 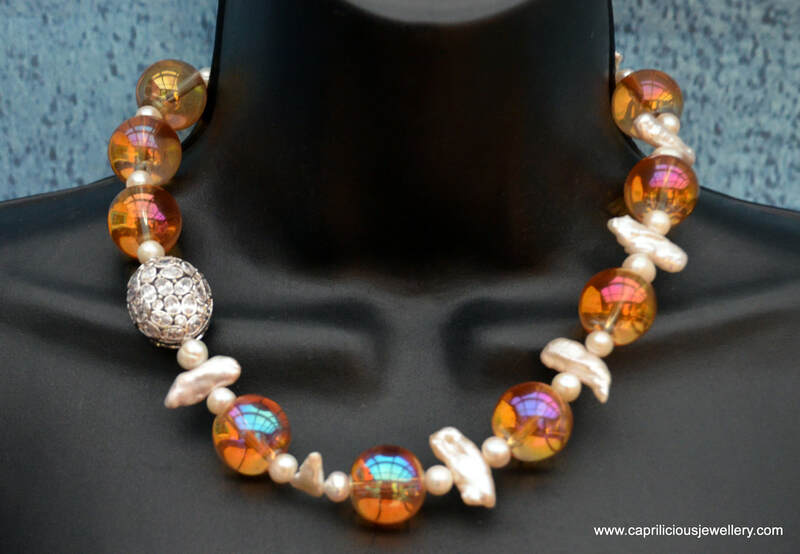 21" long, this necklace is made of crystals in three colours and freshwater pearls, with a sterling silver hook clasp. 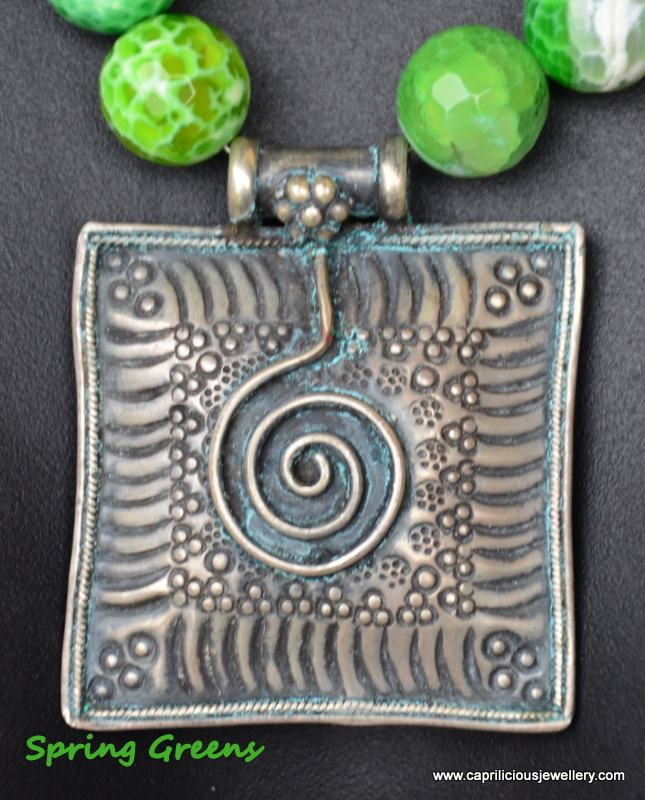 The pendant is made in my kiln, of 99% silver and a polymer clay cabochon, embellished with crackled silver foil triangles protected by a coat of resin. Complementary tiny teardrop/ tribal shaped earrings on sterling silver ear wires go with the pendant. 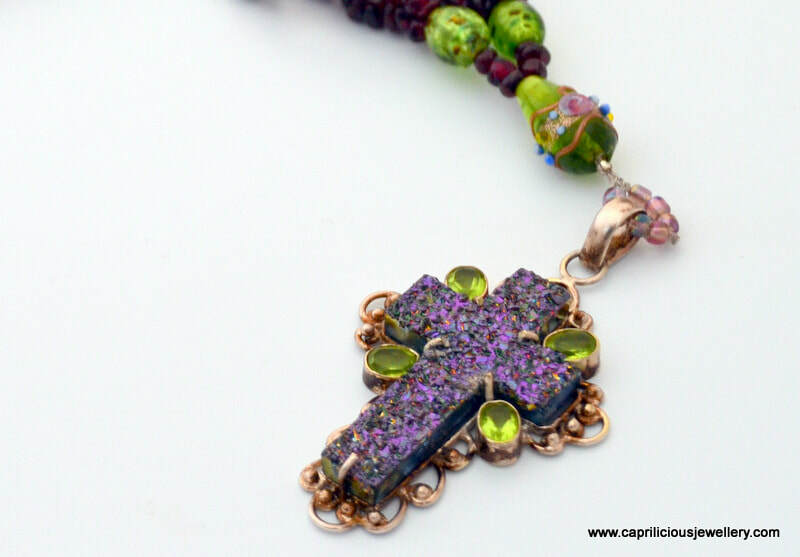 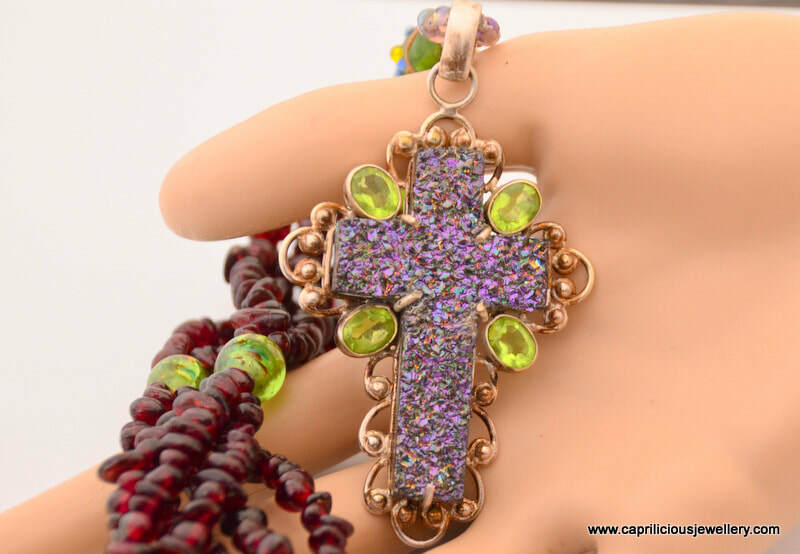 18" long, three strands of garnet beads, held together by green Venetian foiled glass that glows in the light, carry a purple titanium coated druzy cross set in sterling silver, accented with peridot. 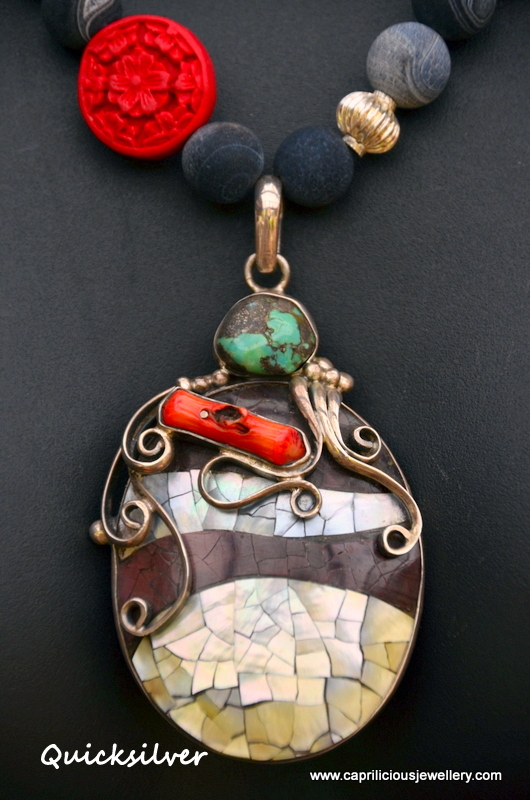 Above the pendant is a Venetian 'wedding cake' bead. 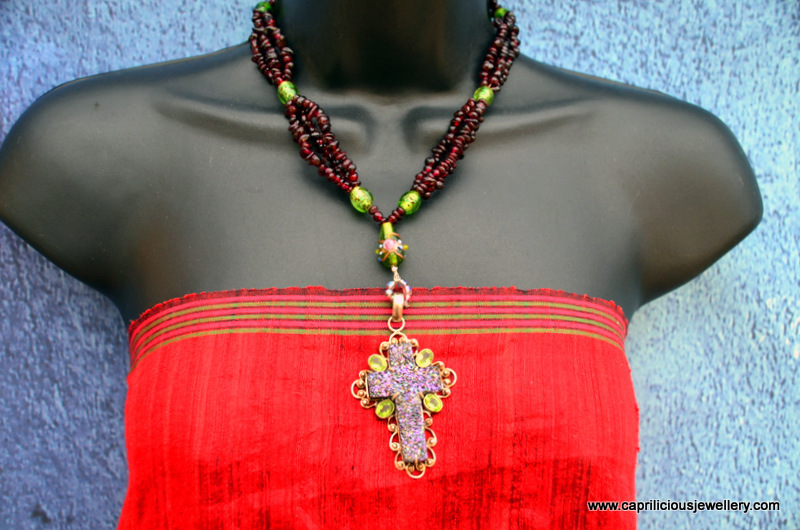 A unique and interesting necklace which is definitely a gothic one of a kind piece. A pewter toggle clasp to close. 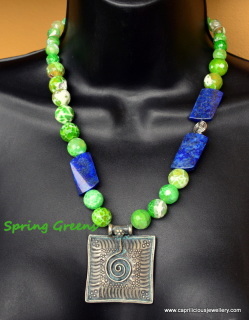 A 22" long necklace made with green fire agate beads, with the most beautiful markings on each bead, and lapis lazuli twisted rectangles carry a sterling silver pendant with tribal markings and swirls, patinated and antiqued to a beautiful blue verdigris colour. 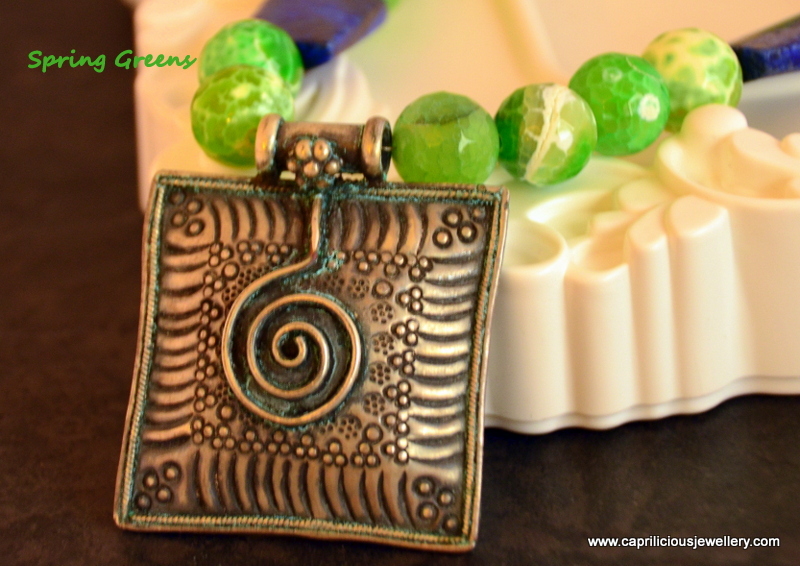 A pewter toggle clasp provides secure and attractive closure. 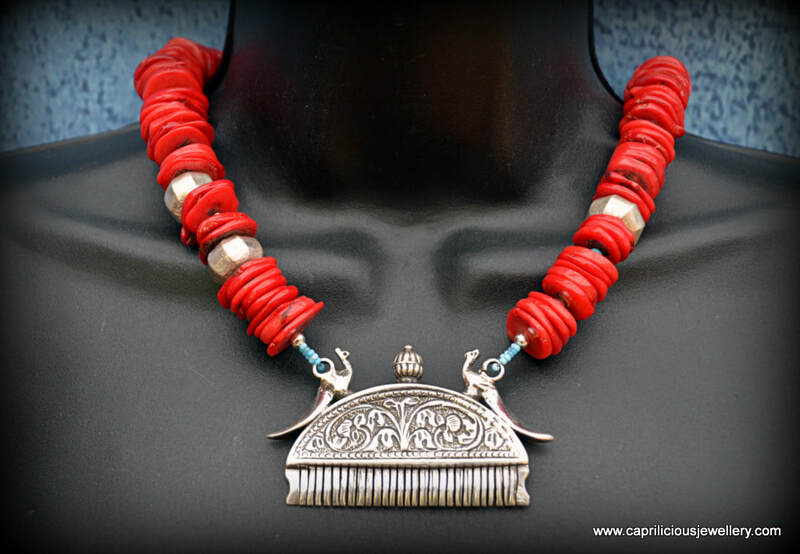 A silver comb from Rajasthan, replica of an antique perfume bearing grooming tool for both men and women, beautifully engraved and embellished by peacocks is carried on a necklace of deep red coral beads, dotted with silver and turquoise. 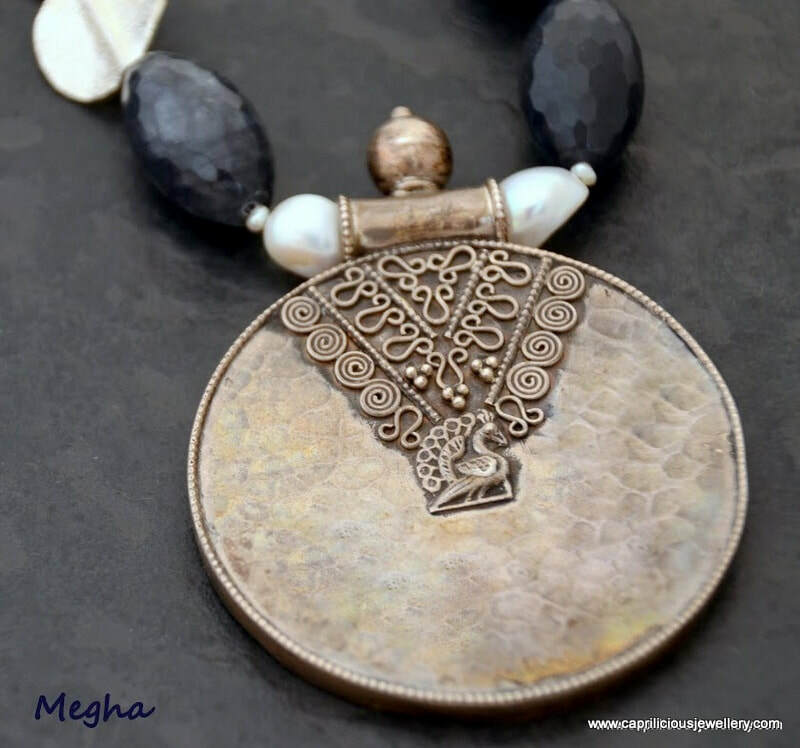 This is a very beautiful necklace, that contains rather a lot of silver and will be an heirloom piece that you will treasure. 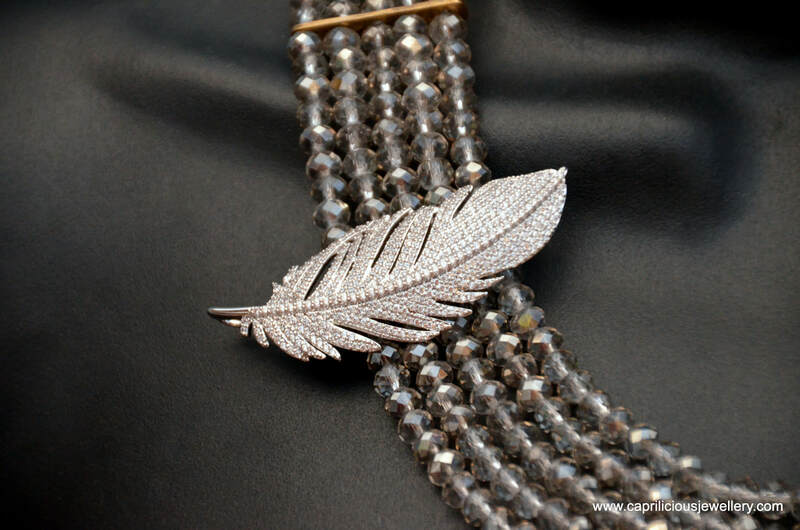 It is an uncommon piece that will be a conversation starter for years to come, A must have piece of jewellery!